See the upper case 4 after the word building :))) This is from the Fraser and Neave 2012 Annual Report. Apparently there are some VoIP Adapters which incorporate G4 in their names :) Very next generation. This is from NTT West Corporation's 2012 Environment Report. Needless to say, these weren't quite the G4's I was looking for. However, aside from a few funnies, the PDF search tool is excellent and saves me much time in research. However, as the saying goes, I digress... back to the G4 and the complexities of actually delivering a real G4 report. As you will see, life in the G4 era is not so straightforward. Thomas Properties Group (TPG) is an American real estate company based out of the City National Plaza in Los Angeles, California. TPG has 129 employees, owns interests in and asset-manages 17 properties with 10.3 million rentable square feet and provides services for additional properties. This is TPG's third sustainability report. Chapeau! The report is 34 pages long/short and is split into three main sections: Responsible Investment, Sustainable Operations, and Stakeholder Engagement. What made us think that this is a G4 report is that TPG says so, in the Content Index. TPG says the report was created "in accordance" with G4. But that's not strictly true. For those who don't yet know the G4 Implementation Manual off-by-heart, I can enlighten you that Page 50 includes instruction on what to write if you have declared your love for G4 but not married it. I tried to contact Thomas Properties but failed to reach them. Left to my own devices, I am going to put this down to a typing error. TPG means G3, not G4. This does not detract from the fact that the company has published three reports to date, and that demonstrates a commitment to stakeholders and to transparency, so well done anyway to TPG! The Singapore Exchange (SGX) has published a 165 page annual report which includes 11 pages which are defined as the "Sustainability Report". These 11 pages include sections on materiality, governance, and social and environmental impacts. Needless to say, it's a very compact Sustainability Report! However, it does include a description of the stakeholder engagement process and a matrix of material issues, of which there are 11, the most significant one being "economic performance". In the introduction to the "Sustainability Report" section of the Annual Report, SGX believes their report is in accordance with G4 at CORE level. Hmm. I believe differently. First, the report contains no GRI G4 Content Index. Second, the G4 indicators selected do not correspond with the material Aspects listed in the materiality matrix. Regarding economic performance, for example, the top material Aspect, none of the EC indicators are reported. Therefore this report qualifies as a G4-Referenced report, and not a G4 In Accordance report. But, it's en route, and that's good! I will add that there is something that impressed me at least as much as SGX's reporting efforts, and that's their responsiveness. I wrote to ask about the missing G4 Content Index, and got a very rapid response, with a copy of the Content Index sent to me by email, and advice that SGX intends to publish this on the company website by end September. I was really appreciative of their response, as I write to many companies and it's like shooting paintballs into Niagara Falls. You get the feeling that your emails just dissipate somewhere in cyberspace. With SGX, the response was fast, clear and gracious. A personal one-scoop CSR Reporting cone is in order for Darrell Lim Chee Lek at SGX. By now, you might be doubting the possibility that any company ever might deliver a real G4 report. However, there is light at the end of the tunnel, and next up is a report which has secured my admiration and even a three-scoop supercone - the height of CSR Reporting Blog praise! Environment Park s.p.a was founded in 1996 by the Piedmont Region, the Province of Turin, the City of Turin and the European Union and is an original type of science and technology park in Europe, combining technological innovation and eco-efficiency. Environment Park is divided into two business units, one dedicated to the management of the real estate and the other, to "research and innovation". The park boasts green architecture and many environmentally friendly features and is run by a compact team of 45 employees. This is the fourth annual sustainability report and claims to be in accordance with the G4 guidelines at CORE level. Oh, and I almost forgot to mention, this report is in Italian, but with a little gelati and Google Translate, I won't let that bother me. Ice cream is the same in any language. Environment Park has delivered a very nice G4 Content Index. It's prepared in accordance with the guidelines, and appears to me to be technically correct. Environment Park has selected 14 material Aspects from the G4 material Aspect table in 5 categories and has reported on a total of 24 Specific Standard Disclosures, almost half of which are environmental disclosures. At 76 pages, the report is manageable and only a tad longer than the previous GRI G3 Application Level B report of 2011 at 64 pages. As for material issues, these are prominently placed on page 5 of the report, set out in a chart which identifies each issue, whether the impact is internal or external to the organization, and how it was prioritized relative to other topics that were identified using the G4 recommended dual measure of size of impact and stakeholder relevance. This is about as technically accurate as it gets. Using the Content Index, it is a pleasure to navigate to the disclosures relating to each of these material Aspects. I have not read the report in detail (Google Translate is not that brilliant) so I cannot comment on the quality of disclosure, and I also won't comment on the relevance, from my perspective, of the material issues selected. My microscopic focus in this post is the way the G4 framework has been applied, and it seems to me that this is the first corporate G4 report I have come across that makes the grade. Supercones all round at the Environment Park. There is also something subtly intelligent about the way Environment Park has transitioned into G4. The 2011 report covered exactly 20 indicators required for Application Level B, which makes the 2012 G4 report not significantly more challenging with 24 Specific Standard Disclosures (performance indicators), plus 2 more if you add in the ones that are part of the General (profile and management) Standard Disclosures. Let's call this 26. Of these 26, exactly 13 indicators reported in 2012 correspond with those reported in 2011, demonstrating a good deal of continuity. The additional indicators added are mainly in the environment category, such as intensity measures for energy and emissions, which were not reported in 2011. Now, having said this, I have an additional quick observation about the Environment Park report. The fact that it is technically correct, in my opinion, as far as the G4 framework is concerned, is fantastic. However, G4 reporting is not just about observing the reporting framework in a mechanical way. There's more to it than just the technicalities. The G4 report of Environment Park has exactly the same structure as the G3 report - same sections and same headings (with the exception of the addition of the materiality matrix). The report is not written around the impacts, it's written around the framework. That makes it G4, but less compelling for report users/readers. The big issues that Environment Park addresses are there, but they could be used to structure the report in a way which makes this organization's transformative role in business and society come to life in a more meaningful way for report readers. There are no internal or external commentaries, and as far as I can tell, no stories or case studies which illustrate in a more exciting way the true role and impact of Environment Park. Reporting at its best, in my view, is a story within a framework. Environment Park excels at the framework. It would be nice to have a little more story. (Disclaimer: I don't speak Italian. My comments are based on a general impression. I hope this is not misrepresentative. Supercones still relevant. ). G4 reporting is now evolving and I hope I will be able to keep pace with the anticipated flurry of new G4 reports. So far, of all the G4 claims that are flying around, not many are actually making the grade. The Global Reporting Initiative has not yet pronounced on its intention to develop a G4 Check, similar to the G3 Application Level Check. This decision was promised for September, so maybe we will hear some time soon. It seems to me that this is really critical. What's the point of having a wonderful framework if companies are misusing it by default or by design? I realize reporting is a journey, but saying we are going to Manchester and ending up in Honolulu doesn't help anyone, even if Honolulu is quite a nice place (Is it? I have never been.) Companies need help in applying the G4 framework accurately, that's my takeout. Understanding G4, my book, provides concise guidance. GRI may also be offering customized assistance to individual companies as they start to use the framework. But this is no substitute for a quality check on whether the output is as declared. I feel we have to start finding a better balance between quantity and quality of reports, and, in my view, GRI should play a pivotal role. Face Materiality with Confidence: Understand the value of materiality and the way it drives G4 reports, grapple with the complexity of selecting material issues and learn how to shape your report around material content. Disclose with Relevance: Prepare meaningful management approach disclosures and select relevant performance disclosures for (CORE) G4 reports. Get the Basics Right: Understand the less obvious challenges in G4 Standard Disclosures and how to deal with them. Make a Plan: Understand how to prepare your first report as a G4 report or make the transition from G3 to G4; select CORE and COMPREHENSIVE options; get the balance of content right for your organization and align content with creativity. Ice Cream: G4 tastes better with ice-cream! It's always a pleasure to tell CSR Reporting blog readers about reports that I have been involved with. Last year, I posted about Liberty Global's inaugural Corporate Responsibility Report and now, I am delighted to bring you an update in the form of the second global report, called Discovering New Possibilities, which was published last week. This report represents a step up in transparency for Liberty Global with a GRI G3.1 report at Application Level B, more extensive than the first C Level report, and covers operations in including UPC (Netherlands, Poland, Romania, Slovakia, Austria, Czech Republic and Hungary), Unitymedia Kabel BW (Germany), Telenet (Belgium), VTR (Chile) and Liberty Cablevision Puerto Rico. A lot can change in a single year, which is reflected in this new report from Liberty Global. The company is now the largest international cable company in the world, following the acquisition of Virgin Media in June 2013, and expansion of presence in different markets, generating a whole lot of economic and social value with revenues of over $17 billion and employing over 36,000 employees. With 24 million customers and over 48 million subscribers to video, internet and voice services, Liberty Global maintains an operation which is transforming access to the digital world - a transformation which is relevant to the quality of life of millions of people in the markets in which the company operates. Liberty Global's approach to delivering this transformation is routed in a compelling vision of the role that Liberty Global can play in society. It's much more than selling modems or set-top-boxes. It's about changing the way people live their lives. It's not enough to connect. It's about knowing what to do with that connection. In the language of Liberty Global, this means Discovering New Possibilities. The Digital Agenda for Europe (DAE) recognizes that access to next-generation broadband with speeds exceeding 100 Mbps (megabytes per second) by 2020 is vital for long-term economic development and competitiveness. The goals of the DAE range from fast broadband for all to increased online commerce to 60% of disadvantaged people using the internet regularly. This is because digital technologies have "enormous potential" to benefit our everyday lives and support the economic wellbeing of Europe, as well as contribute to environmental resource efficiency. Liberty Global, as a seriously large player, recognizes that continually improving technology is not going to do the job. The technology needs to go where it's needed and people need to understand how to use it for their own benefit and for that of others. For example, in Belgium, Liberty Global's company, Telenet, installed 450 multimedia monitors in patient rooms at a hospital, providing video conference capabilities for patients and secure access to patients’ medical information for use by hospital staff, helping to increase the efficiency of staff while providing patients with opportunities to engage with their families and friends. Also in Belgium, Telenet Foundation developed an award-winning program called Recup PC, which helps people to get online, understand how to use the technology and develop digital literacy. Another great example of helping people not only to be aware of new technology but also to increase their capabilities is Liberty Global's innovative web tool called Internet Buttons. This enables people who have some experience in using the internet to create easy-to-use customized starter page for family members and friends who are new to the internet or find it confusing. Large, brightly colored ‘buttons’ act as shortcuts to websites such as email, search engines, Skype, eHealth or other services tailored to the user. These can be saved to a personal homepage, easily accessible at the click of a button and a whole lot less confusing than a bunch of unrecognizable icons and symbols that only experienced users can navigate around. New digital skills – button-wise – is a way to bring the internet to those who otherwise would probably never be able to figure it out on their own. Like most things, it's easy when you know how. But if no-one helps you, you never know how. In Romania, Liberty Global company UPC has developed a platform to get kids interested in technology involved by submitting ideas with the possibility of winning a trip to attend a NASA educational summer camp. Over 230,000 visits to the Tech School website and 570 ideas later, the winning ideas included a super bionic hand, a mobile-phone-charging-T-shirt and a mobile astronomy observatory, showing that, when you provide the tools, kids get engaged and discover new possibilities. The overall winner of Tech School 2012 developed a prototype of a bionic hand with enhanced control and strength, which has wide-ranging implications for surgery, telemedicine and other remote interventions. A UPC Tech School grant will help develop an advanced version of this prototype. Another area in which this report demonstrates the impact and potential positive impact of a company as large and influential as Liberty Global is the ways in which it advances technology, awareness and education to protect kids online. As a mom who has had personal experience of my own child getting into a potentially very dangerous online situation, which I managed to catch in the nick of time, and with kids who are mesmerized by the big, medium and small screens, I am only too aware of the need to protect our children. Liberty Global's report discusses this in detail and provides examples of how the company is supporting media literacy for parents in the Netherlands, campaigning to keep passwords safe in Chile and working in partnership in Europe to create safe internet experiences. The focus of protecting children is on education and empowerment. The nice thing about Liberty Global's report is that stories such as these show how positive impact is created through Liberty Global's core business. This is not a report about switching off lights at the end of the day and retrofitting offices with low-flow toilets (although there is some of that too). The main content of Liberty Global's report is about the role that the Company plays in society, which includes significant discussion about public policy and the complexities of creating internationally aligned protocols for data privacy and more. Liberty Global is active in helping define and shape the future of our digital world, which makes this report quite relevant for almost everyone. Liberty Global's report also covers areas of responsible performance in environmental impacts, people management, supply chain monitoring and management and other relevant issues which affect the sector such as conflict minerals and an important discussion about e-waste, one of the sector's most significant impact areas. Liberty Global achieves a 36% retrieval and recycling rate of set-top boxes and modems, which adds up to over 5,000 tons of e-waste which avoids landfill. That’s equivalent in weight to offering 10,000 people an annual supply of ice cream every year for over 25 years. Unless you are me, in which case an annual supply would last about two days. The transition from first reporter to experienced reporter is not easy. Liberty Global has delivered an equally relevant and more transparent report this year, which places the Company on the right road for a G4 report next time around. With this in mind, I encourage you to take a look, and give feedback! Understanding G4 can help you navigate G4 with relative ease. I'd be happy to spend a day with you talking about it and sharing my insights, working approaches and recommendations. In fact, that day is October 22, in London, when I will be conducting the first Understanding G4 Master Class, an intensive G4 day, in which I walk a small group through the paces of G4. If you can make it, please register soon as numbers are limited to 25 to enable enough time for good discussion and learning, with current examples of reporting practice. If you would like to join me and other potential G4 fans, please register here (Send me an email or DM me on Twitter for a discount code). And yes, ice cream is on the menu. Now, here's a recap of this month's G4 tips. G4 Tip 1: You can't write a G4 report with a G3 mindset. Make the shift to G4. It's a different paradigm. G4 Tip 2: G4 recommends including at least 3 years of data when responding to indicators (Implementation Manual, page 71). G4 Tip 4: Specific Standard Disclosure G4-EN2 includes a methodology to calculate the percentage of recycled input materials. G4 Tip 5: Total energy consumption in G4 should be reported in joules or multiples. G4 Tip 6: G4-33 requires reporting of whether senior executives are involved in seeking assurance for the organization’s sustainability report. G4 Tip 7: G4-52 is a new disclosure required at "In Accordance" Comprehensive Level and requires a description of the process for determining remuneration. G4 Tip 8: Remember that each word is important in a G4 Sustainability Report. Somewhere, there is a stakeholder who might read it. G4 Tip 9: G4 reports may be shorter than G3 reports. Or longer. Or the same length. Your materiality process will decide. G4 Tip 10: Did your Board read your Sustainability Report? Ever? G4-48 asks you to spill the beans (In Accordance, Comprehensive Level). G4 Tip 11: Only go for In Accordance G4 Reporting at Comprehensive Level if you have very robust governance disclosures. G4 Tip 12: G4 reporting is not a race and not a competition. Going slow, and doing it with integrity, is more important. G4 Tip 13: Sustainability reports published after 31 December 2015 should be prepared in accordance with the G4 Guidelines. G4 Tip 14: G4-1 disclosure - CEO statement - includes reference to "key events, achievements, and failures during the reporting period". G4 Tip 15: It is possible, but not recommended, to produce a G4 Sustainability Report with one material issue. G4 Tip 16: Readers of G4 Sustainability Reports must know what to expect. More forest. Less trees. G4 Tip 17: In a G4 Sustainability Report, material issues should smack you in the face. If they don't, it's not G4. G4 Tip 18: G4 does not require companies to list the awards they have received. But, go for it anyway. G4 Tip 19: G4-12 is a simple disclosure: Describe the organization's supply chain. Piece of cake? Maybe not. G4 Tip 20: G4-EN18 requires GHG emissions intensity ratio. Pick your normalization factor carefully and be consistent. G4 Tip 21: Read my book, Understanding G4, before you even start thinking about writing a G4 Sustainability Report. G4 Tip 22: Engage your Top Team in the selection of material issues for your G4 Report. The CEO must sign off. G4 Tip 23: G4 Reporting is about ownership and accountability, not about how many boxes you can tick. G4 Tip 24: Probably best not to select more than 200 Material Aspects for your G4 report. Otherwise it will take you more than a year to write it. Less is more. G4 Tip 25: Transition from G3 to G4 with consistency. But remember the objective is G4, not G3 plus new bits. G4 Tip 26: Go for CORE unless you have a really good reason to go COMPREHENSIVE with your first G4 Sustainability Report. G4 Tip 27: Embedding good reporting process is the key to G4. Bluffing doesn't work all that well. G4 Tip 28: Don't try to be In Accordance with G4 if you can't be. Better to "refer" to G4 and transition when the time is right. G4 Tip 29: Don't expect your stakeholders to praise you for your G4 report. Acknowledgement is also good. G4 Tip 30: A G4 report is hard work. Don't be deceived by it's slick looks. You have to invest. G4 Tip 31: This is the last G4 Tip for this month. It's a short tip. Read all the G4 Tips again and then, just do it! See you in London in October? It's never too late to keep a promise. 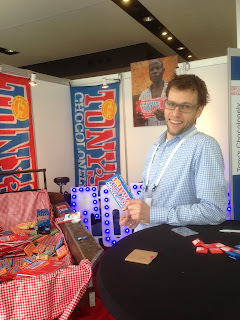 One of the things that sweetened the experience of the GRI Global Reporting Conference in Amsterdam in May 2013 was the free chocolate dispensed with a smile by Tony's Chocolonely at a stand in the exhibition area and throughout the conference. In return for an even bigger gift of free chocolate, I promised to write about Tony's Chocolonely on the CSR Reporting Blog. Yes, it has taken me only 4 months, but it's now quite opportune as it's the Eve of Yom Kippur, and atonement and reparations are the order of the day. So, I atone for not fulfilling my promise so far, and attempt to repair my tarnished integrity by doing so, possibly earning myself a better chance of being inscribed in the Book of Life for yet another year. I hope so. The year ahead promises to be an exciting one - and a whole lot sweeter now that I have discovered Tony's Chocolonely. Of course, chocolate comes second to ice-cream on my indulgence league-table, but in this case, it's very special chocolate. "The Tony’s Chocolonely slogan ─ “on the way to 100% slavery-free chocolate” ─ means Tony’s is 100 percent committed to ending chocolate slavery and to giving customers a slavery-free chocolate choice." Slavery in chocolate is still prevalent enough to put us off our daily (hourly?) treat. The “good life” is still a distant dream for many cocoa farmers and the problems of child and forced labor are still very much in evidence. Based on estimates for the year 2013, at least 460,000 people (children and adults) in West Africa work as cocoa “slaves”, of which about 15,000 to 30,000 children are trafficked into slavery (human trafficking). "There’s a nasty ingredient hidden in that sweet chocolate bar: Slavery. That’s right, lurking in the shadows of the monolithic chocolate industry, modern-day slavery is common practice in many cocoa-producing countries. West Africa, accounting for 60 percent of the world’s cocoa supply, is a notorious haven for chocolate slavery, most often taking the form of child labor abuse. In the Ivory Coast and Ghana, children, hoping for a better life, are lured onto cocoa plantations and tricked into slavery. Most are under the age of 16, working excessively long days, for little or no pay, under physical and mental duress, with no option to leave." Tony's Choc has a different approach, based on the development of direct relationships with farmer cooperatives, working together to develop programs with specific goals and targets for production, in order to support the development of farmer organizations. 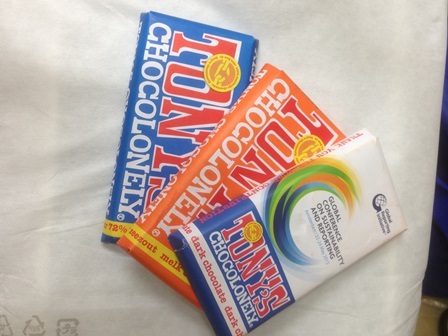 This means that Tony's Chocolonely has its own Bean-to-Bar segregated supply chain, through which the cocoa beans of the farmer cooperatives are shipped directly to the production facility. This way, the folks at Tony's Choc know exactly where the beans in their chocolate come from. In 2012, Tony's Chocolonely signed long-term contracts with two cocoa farmer cooperatives: ABOCFA (Ghana) and Ecookim (Ivory Coast), committing to a five-year purchasing agreement in which the farmers can be certain there is a buyer for their cacao, and at a good price. With the certainty of a buyer, the farmers invest in improving their farms, professionalize and grow. In buying directly from the farmer, intermediary trade is effectively eliminated and the farmer gets more compensation. Within this long-term arrangement, Tony's Chocolonely facilitates training for farmers, enabling increased cacao productivity per hectare and also drives awareness of the need to eliminate child and forced labor and help strengthen the position of women. ABOCFA is a farming cooperative of around 400 farmers in 13 communities in Ghana. In 2008, the ABOCFA farmers gained organic and Fairtrade certifications, becoming the first such operation in Ghana to do so, based on interest expressed by Cadbury's for the Green and Black label. However, after the subsequent acquisition of Cadbury's by Kraft (now Mondelez), interest in ABOCFA farmers' Fairtrade organic cacao ceased, leaving hundreds of farmers wondering how they would recoup their investment. Enter Tony's Chocolonely, who in 2012 became the first purchaser of the Ghanan ABOCFA cacao, turning it into that fabulous-tasting chunky chocolate that 1,600 delegates at the GRI Conference in Amsterdam could enjoy. Me included. Part of Tony's Choc's approach is to help drive interest in the ABOCFA cooperative, to attract more buyers and help ensure the sustainability of the operation. 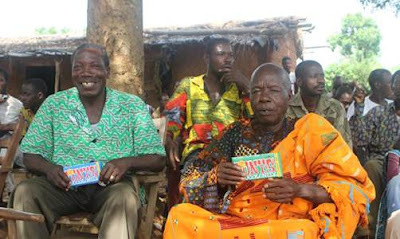 In the Ivory Coast, Tony's Chocolonely purchases from a single village of 128 farmers, working under the auspices of the bigger cooperative union. Again, these farmers have achieved Fairtrade certification and revenue from sales is reinvested to drive increased efficiencies and professional long-term supply. Arjen Boekhold recently visited both Ivory Coast and Ghana, taking with him a generous supply of 'Bean-to-Bar' chocolate with him, so the farmers could taste the chocolate which was made from their own cocoa beans. This made them very proud. For many of them, it was the first time they tasted chocolate at all. Can you believe that? Arjen reviewed the cooperative activities and the ways in which funds to support human rights in the chocolate supply chain have been used. For example, Tony's Chocolonely initiated and supported funding for an awareness campaign on (child) slavery and women's rights, and also provided funds for a cocoa warehouse. The collaboration is as sweet as the chocolate itself. Check out Tony's Chocolonely also on Facebook. More importantly, go buy some! Even more importantly, go eat it! (Oh and by the way, for all those of you observe Yom Kippur, the CSR Reporting Blog, and me, wish you Well over the Fast and that you should be inscribed in the Book of Life for a healthy, safe, prosperous and happy year ahead!) (Even if you don't observe Yom Kippur, we wish you that anyway, except for the Fast bit). Yes, material issues in G4 should be all of the above. Ok, so what if I had a little help from thesaurus.com. First, it's Gap Inc. - I have admired both Gap Inc.'s performance and its reporting over the years. Second, it includes a G4 Content Index. To me, that means it's aspiring to get into the next generation sustainability reporting arena. I think this may also be the first report published by a company anywhere that includes a G4 Content Index. One of the nice things about Gap's reporting is the sense of authenticity it conveys. The report tells you what's going on, no frills, no politically correct, no hiding behind the label. From the CEO letter which describes the report as "a candid, open assessment of our progress as a company and as a collaborative partner to address the complex issues of operating a global business in a responsible, ethical way" to the complexities of the human rights operating context of outsourced production to the difficulties of achieving environmental efficiencies in 3,000 stores around the world, Gap Inc. tells it like it is. In each section, Gap Inc. works systematically through the key issues, providing a good deal of context and background to help us understand the issues, how they affect Gap Inc.'s business, and what Gap is doing about them. Want to know about fire safety in Bangladesh? Gap covers it. Want to know how many kids around the world are forced to work against their free will? Go look at the Gap Inc. 2012 report. Need a data-point on what percent of garment workers are women, globally? Gap Inc. provides. Interested in strikes in the Cambodian garment industry? Get the low-down from the Gap Inc. report. Seek a definition of human trafficking? It's there. In short, a lot of Gap's report is context, which is good and useful. Sometimes it's even more context than report, which is less useful. Gap Inc.'s performance in key areas has been strong: employee volunteering and corporate community contributions have increased each year since 2008. Total carbon emissions have decreased each year for the past three years. So has U.S. energy consumption. The percentage of red-rated factories, that is, those which must put in place corrective action after Gap Inc.'s audits, has reduced each year for the past four years. Gap completed 1,148 audits in 2012. Gap has been driving environmental efficiencies through the supply chain through provision of Green Manufacturing Workshops for key vendors. Overall, Gap Inc.'s report attests to ongoing commitment and good performance. The name of Gap Inc. has become synonymous with championing of human rights in the supply chain and this report continues to testify to Gap Inc.'s leadership in this area. In the 2012 report, water conservation gets a page of narrative, but no data and water conservation is not listed as a material issue. In 2010, seven environmental goals were reported with targets for 2012-2015. In 2012, two of these are reported as completed, one has changed and four have slipped off the map. Instead, one updated and three new goals for 2015-2020 have been developed. Tracking Gap's performance against stated goals in the environmental area needs Rubik-cube like skills. Similarly, I find a disconnect between goals and narrative and data. In the community goals, for example, Gap Inc. reported on progress of a previously stated goal: "Strive to increase the annual value of employee-driven contributions of time, money and talent to the community", noting this has been achieved. However, a chart shows that total contributions and volunteerism have decreased in the past two years. So, the striving was done and the target was ticked? Who cares about striving? This apparent disconnect in Gap's presentation of its strategy and performance over time erodes credibility. It would be more interesting to see the overall strategy, with clear multi-year goals, all in one place, for tracking and reporting in a consistent way each year. Even if the Sustainability Report is biennial, this should not be an excuse for things dropping off the edge in the interim year. This dissonance continues through to the way in which Gap Inc. describes its materiality process. Transparently, Gap Inc describes the way it selected material issues and the criteria for doing so. Generously, Gap Inc. shows us an empty materiality matrix. For our general education and edification. This would be fantastic if the issues that Gap Inc. had identified as material were shown in this three-band matrix. The issues are not separately listed, so the reader needs to do some detective work in order to understand what's material and what's not. Frankly, G4 or otherwise, I do wonder about the sense of including all the detail about materiality process and then not actually stating the issues and where they fit. I agree that prioritizing issues within the high, medium and low materiality bands is redundant, but if the work has been done to place issues in one of the three boxes, and deliberately not disclosed, we the readers become more interested in why not, than in what the issues actually are. It diverts our attention from the substantive to the technical aspects of reporting. However, as I usually take a detective-type approach when reviewing reports (just call me Pink Panther) I understand that the Gap Inc. report content list serves as the material issues list, and the issues for which material Aspects are included in the G4 Content Index are the ones that fall into the high and/or medium materiality box. Well, that's how I understand it anyway. Crystal clear, right? Working on this premise, I see that Gap Inc. has identified 15 material Aspects (out of a possible 46) and reported on 21 indicators out of a possible 91 indicators. Water conservation, as mentioned above, earns a place in the report content list and some narrative, but not identification as a highly material Aspect. Given the amount of water used in cotton-production, and what Gap Inc. refers to as freshwater risk in the report narrative, I find it surprising that water did not merit inclusion as one of the top material issues. The G4 Content Index itself is online, and is nicely hyperlinked to different parts of the online report. However, the Index is not quite what it is supposed to be. For example, several disclosures refer to Gap Inc.'s annual reports for 2011 and 2012, or other documents, providing a general link to the webpages of these documents. This is not the GRI way. "Information related to Standard Disclosures required by the ‘in accordance’ options may already be included in other reports prepared by the organization, such as its annual report to shareholders or other regulatory or voluntary reports. In these circumstances, the organization may elect to not repeat those disclosures in its sustainability report and instead add a reference to where the relevant information can be found. This presentation is acceptable as long as the reference is specific (for example, a general reference to the annual report to shareholders would not be acceptable, unless it includes the name of the section, table, etc.) and the information is publicly available and readily accessible. This is likely the case when the sustainability report is presented in electronic or web based format and links are provided to other electronic or web based reports." There are some other examples of where the Content Index doesn't quite provide a route to an actual relevant disclosure as required by the corresponding reporting indicator. Any report that proclaims any level of G4 adherence is bound to come under the microscope in the coming year. The G4 promise is focus, clarity, and materiality. It's next generation. It's leadership and reporting best practice. Clearly, the early adopters are going to be scrutinized. For better or for worse, Gap Inc. has put itself in that space and while this report does not claim to be "G4 In Accordance", it does include a G4 Content Index. It's the Index that hooked me. I believe that this report doesn't do full justice to the fabulous work Gap Inc. has done and continues to do in the garment industry. If you asked me who are the best apparel players for sustainability in this sector, Gap Inc. would certainly be one of the top companies I would cite. I think this representative of the reporting challenges we all face. How do we present our sustainability risks and opportunities, and more importantly, impacts, in a clear, complete and balanced way, telling our story so that it reflects our organization's achievements, and remains within the constraints presented by the GRI Reporting framework? Clearly, it's not that simple. Daniel Fibiger is Senior Manager of Strategy and Performance in Gap Inc.’s Social and Environmental Responsibility Department, and he expresses the challenge well in a post he wrote to introduce Gap Inc.'s 2011-2012 report: "... as the author of the report, the task of trying to summarize or highlight certain aspects of it is an unenviable one. Part of this might have to do with my background. I’ve been with the company for just over two years, and previously worked for several human rights NGOs, where I partnered with major apparel companies to address human rights issues in their supply chains. So when I try to think about what’s important, my answer is: all of it.....I also believe this is a work in progress. My hope is that our next report has more focused goals, provides more comprehensive data-driven insights, and more effectively conveys the impact we are having. If we do those things well, we’ll also be able to make it shorter, which will hopefully lead more people to read it. The work starts now on delivering that." Gap Inc.'s report may not fit the G4 structure perfectly just yet, but the great progress and authenticity, right up to admission of the challenges of reporting, is evident in Gap's culture, and maybe that counts for even more than an impeccable G4 Content Index. Will SASB make G4 redundant? The Global Reporting Initiative has never met the challenge of developing great and focused sector guidance. With just a small number of sectors for which specific guidance is available, we might be inclined to say that GRI has missed the boat. Even with the seemingly hastily put-together publication on Sustainability Topics, which could use a good edit, and a little formatting, the GRI is still nowhere near catching up with the times when sectors, not companies, rule the world. Or as we fondly refer to it: The Sustainability Accounting Standards Board. Almost before we could blink, SASB set itself up, inspired us with a vision ("SASB envisions a world where all forms of capital are accounted for and managed"), played on our aversion to information overload and irrelevant content in Sustainability Reports, created a strong governance structure and network, made bold, measurable and time-bound declarations about what it would accomplish, remained focused on a singular goal of "creation and dissemination of sustainability accounting standards for use by publicly-listed corporations in disclosing material sustainability issues for the benefit of investors and the public", achieved accreditation by the American National Standards Institute (ANSI), published a first set of healthcare standards, and even started to generate a revenue stream by selling off its industry briefs that were used in the development of the new standards. SASB has done for sustainability materiality in a short couple of years what GRI has not done in 15 and the IIRC is fumbling about trying to do in what may still turn out to be the most invested flop of corporate reporting. Despite the first real output of SASB, the new healthcare standards, being pipped at the materiality post by the earlier publication of the G4 guidelines, it's probably true to say that the SASB hype has done no less to focus the debate around materiality. A neat matrix of sustainability issues on the healthcare sector radar is freely available on the SASB website (as are all the standards). A cursory glance will tell you that there is nothing rocket-science-ish about this. The same fairly generic issues that GRI has incorporated for years and years feature in the SASB matrix: energy, water and waste efficiency, product safety, corruption and bribery, manufacturing and supply chain management, employee recruitment, development and retention, ethical marketing and more, alongside sector-specific issues such as patient safety in clinical trials, counterfeit drugs, climate change impacts on human health and patient privacy and electronic health records. Clearly, and not surprisingly, although SASB is focused on the SEC disclosures of U.S. publicly listed corporations, there is some not miniscule overlap with existing sustainability reporting frameworks. I took a deeper look at the SASB Standard for Pharmaceuticals, a sector I know quite well. The first thing that strikes you is that the document is only 34 pages short. Wow. Only 34 pages. That's one tenth of the totality of the G4 guideline materials. Guess they had a good editor. The second thing is that the pharmaceutical industry, according to SASB, has 11 material topics. Interestingly, climate change is not considered material for the pharma industry so no data on carbon emissions is required to be disclosed by the SASB Pharma Industry Standard. The SASB Standard says about these issues: "Sustainability disclosures are governed by the same laws and regulations that govern disclosures by securities issuers generally. According to the U.S. Supreme Court, a fact is material if, in the event such fact is omitted from a particular disclosure, there is “a substantial likelihood that the disclosure of the omitted fact would have been viewed by the reasonable investor as having significantly altered the ‘total mix’ of the information made available”. SASB has attempted to identify those sustainability topics (above) that it believes may be material for all companies within the Pharmaceuticals Industry. SASB recognizes, however, that each company is ultimately responsible for determining what is material to it." In other words, there is an expectation that every pharma company will disclose on these issues, as they all appear to be relevant for pharma companies. Beware, if you do not disclose, the U.S. Supreme Court may make your life very difficult. Drilling down into the nuts and bolts of the SASB Pharma Standard, you fairly soon start to feel that familiar disclosure-related headache coming on. The 11 issues beget 30 metrics, and metrics they are. Try HC0102-03 (Drug Safety and Side Effects): List of products listed in the FDA’s MedWatch Safety Alerts for Human Medical Products (Drugs and Therapeutic Biological Products) database, including those products with Potential Signals of Serious Risks or that have New Safety Information identified by the FDA Adverse Event Reporting System (FAERS) or HC0102-08: Number of FDA Clinical Investigator Inspections of investigators used for clinical trials during the past year that resulted in: (1) Voluntary Action Indicated (VAI) and (2) Official Action Indicated (OAI). This is seriously sector sector. But is it sustainability? Or is SASB getting so granular that we will all need a PhD in PII (Pharmaceutical Industry Impacts) to understand it? A comparison with G4's General Standard Disclosures and Specific Standard Disclosures yields the observation that roughly 14 of the thirty SASB HC metrics are exclusively sector specific, while the remainder are broadly comparable to GRI metrics in contained in G4. In some cases, the wording is a little different and one or two of the details required for disclosure are not directly comparable, but, broadly speaking, less than half of the SASB Pharma Standard metric are exclusively sector specific. The ones that are include Drug Safety and Side Effects, Clinical Trials and Counterfeit Drugs, as well as certain specific aspects of Manufacturing and Supply Chain. The 16 SASB indicators for which I see a certain correlation with G4 are shown in the table below. The implications of this for G4 Pharma reporters that are publicly listed in the U.S. and wish to comply with both SASB standards for reporting to the SEC in their Forms 10-K or 20-F, and wish to deliver a G4 "In Accordance" G4 Sustainability Report, is that they will need to take into account the material issues identified for their own company through due process as well as the thirty SASB sector indicators. This seems to indicate, then, that the G4 CORE option seems to be the most sensible for U.S. pharma reporting companies that wish to meet both the relevant, non-overload desires of the regulatory and investor community, while meeting the needs of the sustainability reporting community with no additional massive effort. Why prepare 100 disclosures when 64 will do? Of course, it's not as simple as that. Life never is. G4 process requires more of an effort to identify material issues than copying a "this is one we prepared earlier" version directly out of the SASB Standard. In G4, Material Aspects should be the result of a discussion with stakeholders, not materiality-by-proxy, using the list that SASB developed. Of course, the SASB standards represent fabulous guidance for the pharma industry, not just publicly traded U.S. companies, but for all pharma companies around the world. Once SASB becomes more established, and there are more standards out there, we will definitely see a leakage to sustainability reporting, with SASB-defined material issues lists being a key input to, if not a key output of company materiality matrices. Is it appropriate to use this materiality-by-proxy approach in G4? If companies choose to do this, then we will possibly see G4 CORE reports referring to G4 disclosures reported under the SASB banner in 10Ks and 20Fs (as companies currently refer to Annual Reports), leaving the G4 sustainability report to include only the General Disclosures and Disclosures on Management Approach for the relevant issues. This could have the effect of continued fragmentation of sustainability information and perhaps, relegation of the sustainability report direct content to general approaches, policies and plans, with no teeth, leaving all the quantitative information to the regulatory disclosures. Might this make Sustainability Reporting redundant? For 10K and 20F companies, that's a possibility. However, we must remember that the SASB definition of materiality is different from the G4 definition. SASB focuses on material events which "will have a material favorable or unfavorable impact on net sales or revenues or income from continuing operations" while GRI focuses on material issues which are defined as "those that reflect the organization’s significant economic, environmental and social impacts; or that substantively influence the assessments and decisions of stakeholders." In a G4 report, we might see, for example, a pharma company not identifying corruption and bribery as currently material to their business. In this case, SASB would require disclosure but G4 would not. On the other hand, climate change might be seen as material by a pharma company, so G4 disclosure would be required where SASB would not. To get a sense of what happens now, I took a look at Merck's 2012 Sustainability Report, a self-declared Application Level A G3.1 report, which also reports against the Access to Medicine Index, Millennium Development Goals and UN Global Compact Principles, as well as the Carbon Disclosure Project carbon and water disclosures. In addition to reporting against 6 frameworks mentioned above, Merck lists 36 KPIs, some of which are relevant in the SASB line-up, some in GRI, and some in none, such as two indicators on employee volunteerism. And yet, when I tried to find a response to a specific G4 Energy disclosure, total energy consumption by source, I had to download the company's CDP submission which records energy consumption by source in MWH whereas Merck's Sustainability Report refers to total consumption in trillion BTUs (G3-EN3). In other words, more may not be more. More may be confusing. Abbott Laboratories 2011-2011 report defines their four priorities slightly differently. The Abbott report is GRI referenced (does not disclose an Application Level), reports on fewer indicators than the Merck report, and, in addition to the GRI Index, provides a list of 27 key metrics in financial, social and environmental performance. The presentation is user-easy with interactive graphs so that I could quickly find, for example, total energy consumption in gigajoules, the preferred reporting unit for GRI, although some of the Abbott metrics appear in no other published framework, for example, global vehicle accident rate, and U.S. employee giving campaign results. Are these company-specific material issues? Will Abbott and Merck gain by using the materiality-by-proxy reporting method in the future? Merck was represented on the SASB Healthcare Standards Working Group but Abbott was not. Maybe that's a hint. There is no doubt that the SASB approach could serve to reign in and align the disclosures of pharma companies around what are probably most of the core sustainability issues that affect the industry. In that sense, SASB does corporate sustainability reporting a good service, and perhaps may help achieve some sort of comparability which G4 does not. On the other hand, sustainability issues by sector are not necessarily sustainability issues by company, and the SASB route applied to sustainability reporting may leave some gaps. If innovation is material to Abbott, whereas employees are material to Merck, we may see very different materiality priorities, and probably, very different G4 reports but similar SASB disclosures. By now, I guess you are expecting me to answer the question, will SASB make G4 redundant? Well, like any good blogger, I am going to hedge my bets. With both SASB Standards and the G4 guidelines seeing the light of day earlier this year, and with only one non-corporate G4 report having been published to date, the jury is out as regards the level to which both frameworks will be taken up by corporates. Will SASB be widely adopted? Will G4 be widely adopted at CORE level once G3 is killed at the end of 2015? If so, will companies align the two? Will companies use due process to determine material aspects and aspect boundaries, or will they use the materiality-by-proxy approach? Or will GRI and SASB finally get around a table and issue a new set of guidelines, called G5-SASB, which converts G4 into a suite of linked sector specific guidelines which incorporate both G4 and SASB disclosures by sector, for use as a basis for both G4 Sustainability Reports and 10K-20F corporate reporting? Either way, we perhaps ought to remind ourselves what Sustainability Reporting was designed to do in the first place. Account for company impacts on all stakeholders. Both GRI and SASB have an important contribution, I feel. The shame is that both appear to live on different planets, while the companies that are reporting are all on the same planet, and, more importantly, we are too!